Auckland public transport patronage for September is now available and sitting on a Shinkansen racing across Japan seems like the perfect time to write about it. Once again you can see that with bus, it’s the busway that continues to be pull up the numbers up with stellar growth. With Ritchies now running all but two buses in the peak as double deckers, hopefully we’ll see this fantastic growth continue. AT also report that they’ll be adding more NEX services to the peak in January and February head of March Madness to help cope with expected demand and ongoing growth. But the growth on then NEX also means that the results on other bus services remains poor. AT have said in the past this is partially due to a range of issues such the CityLink buses no longer being free, buses from the west not being as attractive due to the changes with the CRL works and poor overall performance on buses in the south, something we should hopefully see some improvement on as a result of the new network. On trains there are continues to be strong growth but the percentages in recent months do appear to be starting to reduce from the regular 20%+ we were seeing for a couple of years. But we did expect this to happen eventually and in reality it’s odd to be seeing 20% growth as a normal thing. What’s worth pointing out though is that even though growth as a percentage is slowing down a bit, it’s primarily due to being compared against a higher base. In total numbers it remains high and on an annualised basis we’re continuing to add over 2.7 million trips a year as you can see in the graph below. What’s also worth noting is the results for the different lines. Following the long awaited increase in frequency on the Western Line it continues to grow well and on an annualised basis has now passed 6 million trips. It’s worth noting that just 9 years ago the entire rail network had fewer trips on it that. At the same time the Southern Line only had 4% more trips than September 2015. I wonder if what’s driving this is the same as affecting buses or if there are other issues such as capacity constraints. AT do say they’ll me making some slight changes to how they run trains from this month which will see another 3-car set freed up which can be used to help increase capacity. There is planned to be a new timetable in March which will see services sped up and which will free up two more 3-car sets to increase capacity. AT say the March timetable will finally see the electric trains on the Southern and Eastern line running faster than the diesels that they replaced. On the Western Line speeds will be about the same as they were and can’t be faster due to the safety measures needed around the way too numerous level crossings. For rail, on an 12m rolling basis there are now over 60,000 trips being taken on weekdays. Ferries continue what has been some solid growth and while most of it is on the except services (Devonport, Waiheke and to be soon to be formerly Stanley Bay), as a percentage growth is strongest on the contracted services which is an area AT have been improving services. With some recent improvements to Half Moon Bay and Pine Harbour, and the new Half Moon Bay ferry terminal under construction, we’ll hopefully see these results continue to improve. 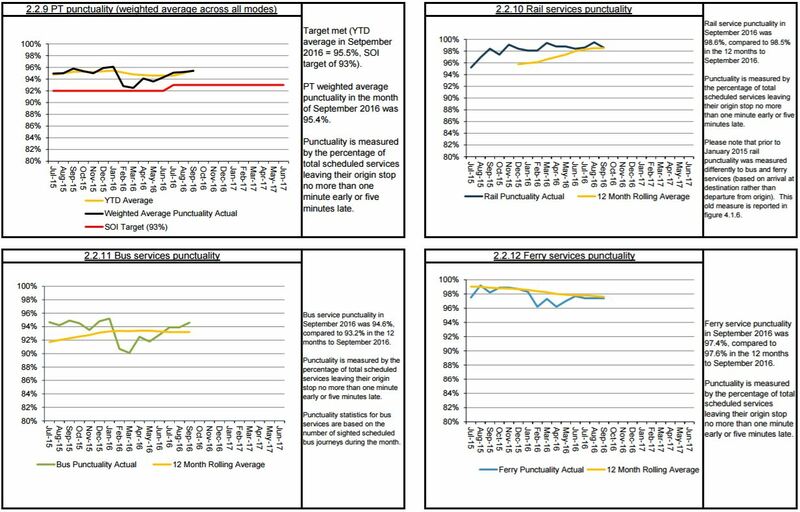 On to some of the other PT metrics, punctuality seems to be a mixed bag. Overall it is improving but has been declining on ferries. Over the last year or so, AT have standardised all of their punctuality metrics to focus on the time the service departed its origin destination. I don’t agree with this way of recording results as it feels like a convenient way to make the results look better than what most people experience, especially for buses which often get caught in congestion. As a comparison, for rail AT still show the percentage of trains that arrive at their final destination within 5 minutes and that shows 96.3% of trains on time vs the 98.6% based on departure time. Since the introduction of integrated fares, farebox recovery has fallen a bit. This was to be expected but is still will within AT’s target range for this financial year. 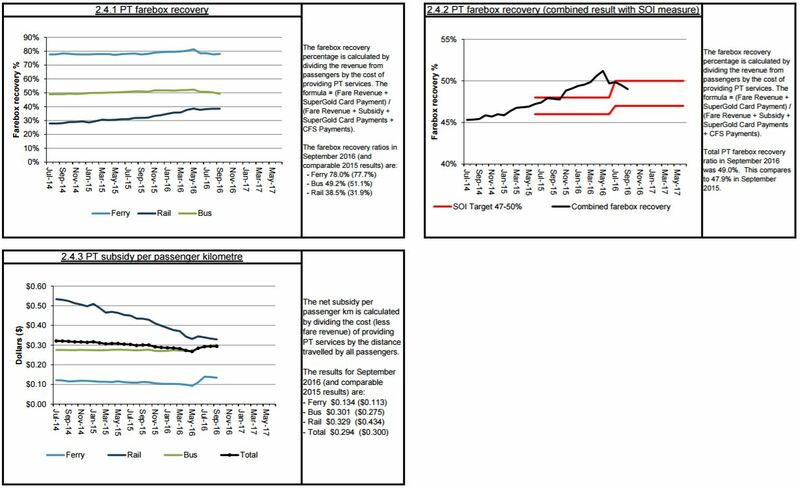 NZTA’s farebox recovery policy means it needs to reach 50% by June 2018 so at 49% it’s still looking pretty good. One positive thanks to the increasing patronage is that the subsidy per passenger km for rail continues to improve. We should also start to see it improve for buses from November with the New Network in South Auckland saving AT around $3 million annually. 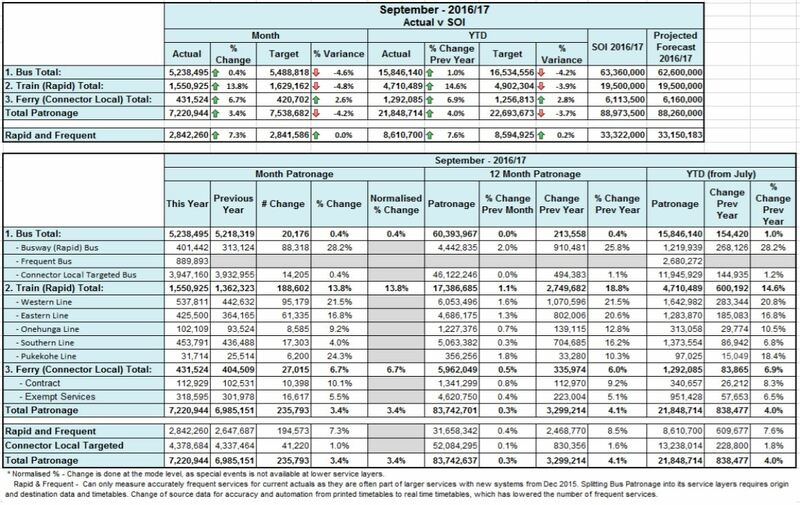 HOP usage continues to improve, with 84.5% of all trips in September being via HOP. What is interesting is the steady increase in HOP use on ferries. I wonder if this is mainly due to the increase in contracted services. Overall we’re continuing to see some positive results. Now back to the rest of my Shinkansen trip. rather than interpreting differences in patronage growth in terms of transport modes (rail, bus, ferry etc), I’d like to put forward an alternative interpretation: The Rapid Transit Network continues to grow much faster than the rest of the network. Just to highlight how misleading a modal interpretation can be: The Northern Busway is the fastest growing part of Auckland’s PT network. 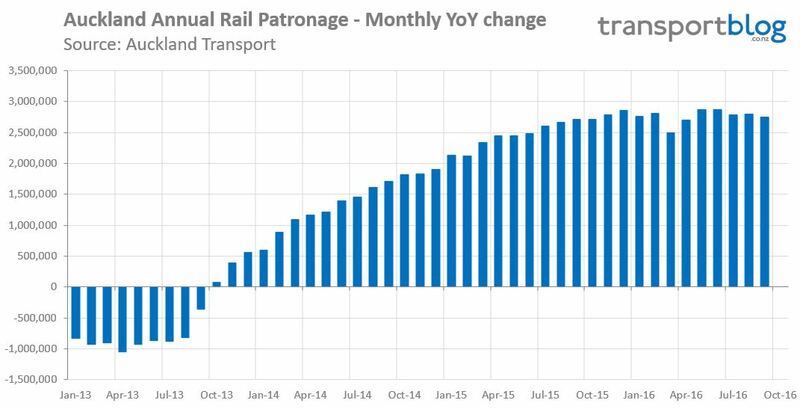 Indeed, if current rates of patronage growth on the Northern Busway continue for another 3-6 months, then it will overtake both the Eastern and Southern rail lines in terms of total patronage. That’s quite extraordinary for a piece of infrastructure that is barely a decade old, which cost little more than $400 million in today’s dollars and where services operate close to 100% cost recovery. Nutshell: Frequent, fast, and reliable public transport is a winning combination. Regardless of whether it is rail, bus, or ferry. Or LRT or light metro for that matter, both of which are modes that Auckland might see in the not too distant future, all going well. Yes. I’d go further and say that the data is telling us that Rapid Transit is the only show in town. 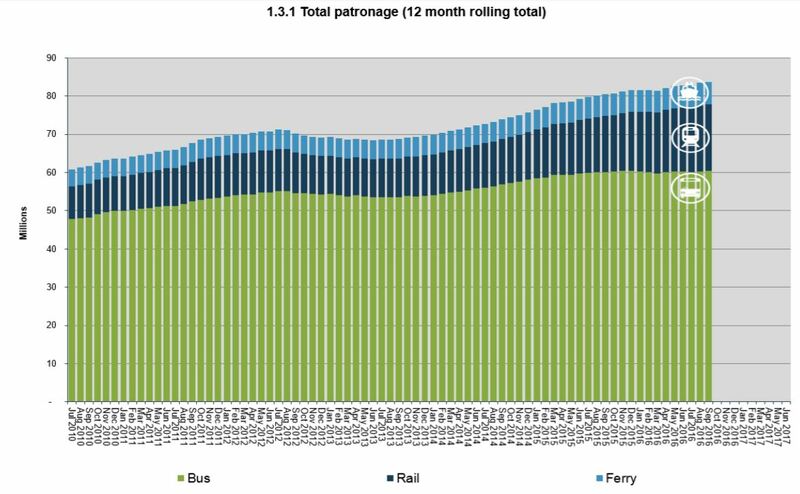 The rate of rail growth has softened a little from adding 1 million additional rides each quarter to 916k, but the Busway is powering on strongly so together the Rapid Transit Network is still adding 1,220,000 additional journeys every 4 months, or 305k every month on an annualised basis. A full and connected Rapid Transit Network [as we have long argued] is want people want and will use whenever they get the chance in Auckland. And it is a vital and available tool to reduce the waste and costs of traffic congestion. And a likely prerequisite to any Road Pricing scheme, both politically and practically. It is therefore hard to believe that SH16 has just been massively widened for street clogging traffic without a relieving Busway along its route and that the AMETI busway project languishes on the drawing board also unbuilt. It is urgent that these two areas of the city without any Rapid Transit are added to the network, both for the value to these areas alone but also the wider pressures on our road networks: We know these projects will work, both for direct users and all other road users by freeing up roadspace. The rest of the bus system is still very important but without this complete and connected spine of the highest quality separate Rapid Transit it can’t be expected to make a transformational shift in accessibility and city performance alone. Plus the ‘busway’ is only the trunk NEX and 881 routes if I’m not mistaken, there is a whole lot other services that use some or all of the busway. Add those in and I imagine it is already the busiest ‘line’ in the network. – HOP usage on buses continues to grow steadily. This is really positive because buses are most negatively affected by cash-paying customers because of their impacts on dwell-times. Lingering question: Is there any mention of what is happening with dwell-times on the EMUs? By my calculations the current dwell times in Auckland are about twice as long as good-practice (55 seconds versus 30 seconds). That’s adding probably 5-10 minutes to the run-time for an EMU from Papakura/Swanson. That’s about 10-15% of total run-time. That’s a huge inefficiency. Or opportunity. Depending on how you look at it. Every speed increase results in significant patronage gains. Even if it’s already faster to travel by train from the station, if you increase that margin then it means people can walk further, or catch connecting buses, to the station, and still come out ahead. Then you consider all the people who would end up in the grey zone (where people may choose PT due to price, parking, etc) and it results in a lot more trips. Looking at the new southern network for buses, I think you can probably expect a further decline in bus usage once the southern network is rolled out. But you will see an increase in train patronage especially from otahuhu. It is good news that the trains will be faster on the southern line but why cann’t they roll it out sooner. Is there any news on the Christmas shut down period yet for the rail services? Why would you expect a decline when the service is massively improving? A small initial decline followed by years of steady growth, maybe. We are likely to see a drop on the buses on the southern network buses because the buses along the great south road route are being effectively eliminated pass Otahuhu, so people who caught the buses to City (University/AUT/Upper k road) plus to penrose will either take the train or drive. A lot of people I talked to recently do not want the hassle of transferring at Otahuhu. This is going to have a positive growth in train usage but negative growth in southern network bus usage. Also a number of feeder services to manurewa station have actually decreased in real terms, so the I do not think the overall benefits of the new network will balance out the fact that there are only 3 (express services) in the morning between papakura, manurewa and city. For people living in papatoetoe near hunters corner/central papatoetoe are going to be stuffed by the new network (428 service is only 30 minutes or so) if they want to get to City (they will all need to transfer at Otahuhu. Even with integrated ticket (which is a great think) the inconvenience of making these changes is going to put people off, especially if the southern line trains are packed to the brim by Otahuhu. Having to change from a frequent service to another frequent service should be the least of peoples worries, especially when the new bus terminal at Otahuhu is operational (and subsequently Manukau). The fact is the long bus routes from Papakura to the CBD are inefficient and many global cities have curtailed long routes such as this as the peak vehicle requirements vary too much on different parts of the journey. I don’t disagree with your point, but you haven’t chosen a good London example – the X68 bus from central Croydon goes right through the centre of London to Russell Square. The X68, I forgot about that one. One of the last remaining contracted express routes. Kind of agree and kind of don’t. Otahuhu has a train every 5 mins during the peak (1x southern 1xeastern) so the connection will be quick and hopefully hassle-free for passengers transferring from bus to train. The down side with the buses no longer running from the South to the City is that the train stop is just britomart (pre CRL). Where as the bus had many stops in and around the city centre. hoping on a link bus is again an option for those travelling to areas not easily walkable from britomart. although that means potential transfers from bus to train to bus. Once again, if transfers are quick and easy I don’t see it being a problem. That’s a good point, the frequent network is great, IF you’re going to Britomart. For me, starting from midtown, the missing link to go south was getting to Newmarket station. It is possible to take the bus to Britomart but that’s a very slow option (usually slower than walking), and that was before the CRL works started. The red link bus would be a logic option along Queen Street but is extremely slow as well. The buses to Remuera via Queen Street are kind of OK, but low frequency in the weekend. In any case I’d be underway for well over half an hour before arriving at Newmarket. Same problem getting on the Western Line of course. Here, a service via Albert Street – Great North Road – Bond Street – Kingsland would be faster than the current 22x with their detour via Symonds Street. I guess my concerns will be in the evening particularly getting off the train and missing the bus to where you need to go, especially if you arrive at Otahuhu after 6 pm on cold wet days. Some of the feeder service are particular poor such as 456, 428, 454, 466. Most of those services are either 30 minutes or once per hour. You are currently seeing only poor growth/performance on the southern network now and after the new timetable I can not see any improvement. Some of the trains are already quiet full by Homai, so is there going to be much room for more lots more people getting on at Otahuhu. Maybe I am being overly negative but I just can not see things improving much with the new network. So your mates say the won’t catch the bus anymore. Stated preference surveys, even far more scientific ones, are terrible at predicting reality. Auckland is just like other cities; people want turn up and go grids. Also, any savings from not running buses to the city have been reinvested (plus 20% ) into more kms elsewhere in the south. Unless this person is talking to all the potential passengers who might make use of such service? And why do we need to speculate when we can just wait? Transferring onto a 15-minute frequency is kind of the pain limit. Less frequency than that, and you’ll have to either tolerate long waits, or start working out those timetables backwards along the first service you’ll take. Which really gets interesting if those service frequencies have some odd ratio, like 10 minutes vs 15 minutes. 1) will I make it to my destination every time? 2) can I leave at roughly the same time every day and expect to arrive at roughly the same time? 3) what if I leave 5 minutes early or late? What about 10 or 20 minutes? Will I still be underway for a similar time? I would hope (1) is sorted out by now (it was not the case 5 years ago). Good punctuality and service delivery will ensure (2) is a ‘yes’ as well. But if your journey involves a transfer to a non-frequent service, then it will score very poorly on number 3 (leave 5 minutes late, arrive 30 minutes late). Which makes it a non-starter for a lot of trips, and at best annoying and stressful. A grid of frequent services will probably be slower than a spaghetti of door-to-door trips, and have less coverage, but it will score better on those 3 points above. Think about driving: It scores pretty well, even in the presence of congestion. Even if PT is on paper faster than driving, diving will often still work much better. For a lot of people, predictability is a really important property of a transport system. I’ve heard a few complaint when people have lost their perfect one seat ride from A to B, but once they get over it & find the transfers good (hopefully) then should be fine. In any case surely a quick transfer at Otahuhu is better than trundling up Great South Road and stopping at every set of traffic lights choking on gas fumes? I don’t think that is really true. There are eight feeders to Manurewa (two through routes and four that terminate there). Of those eight corridors feeding to Manurewa, six will run every 30 minutes or better all day every day, and every 15 minutes at peak times. That’s a pretty awesome level of feeder service! Irrespective of it’s impacts on bus patronage, I think people changing from using express buses to trains is a good outcome. Good luck to your mates who plan on driving, once they deal with Southern Motorway traffic and parking costs I think they will find an Otahuhu transfer quite appealing. I’m not getting how bus transport will decline, I predict it will be just as strong. 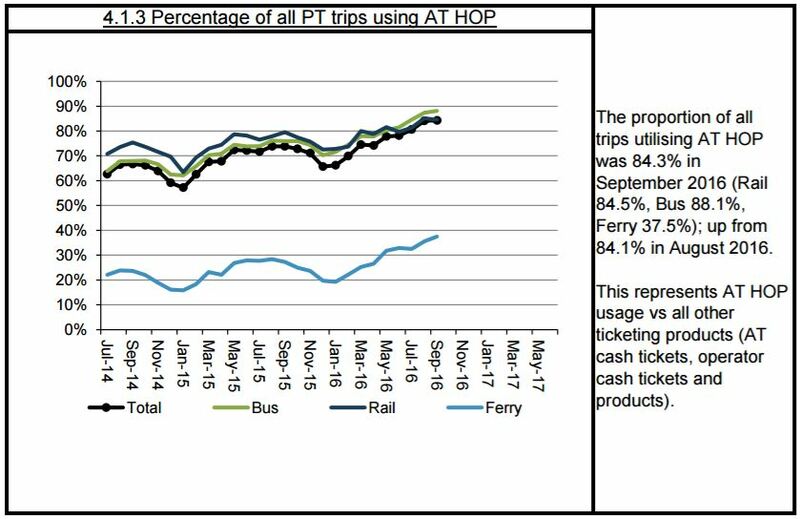 In fact getting rid of the long inefficient routes from the city to beyond Otahuhu should at least encourage bus/train journeys which are now better priced under the AT HOP. I doubt these people will convert to driving. I predict people will pick up the new southern network very quickly. It’s been well advertised & the routes so much simpler to understand. New otahuhu station will kick it off pretty good. Once manukau station built even better. I think another positive for the new networks (with more transfers necessary & less close together stops) is that it will mean an increase in activity of people generally. When the Parnell station opens, University staff & students can choose to walk up through the Domain, rather than say bus from Britomart. See that health index rise! I’ve been noticing for the past few weeks that the set that does the 0558 Britomart to Papakura has been loading incredibly well. That set is Southern Line starting at Puhinui at 0506. The new southern network will have a massive impact on the southern line. Currently, city bound trains, can be busy before Homai Station. The Southern and Eastern Line really need to increase capacity and frequency to cope with the increase of patronage. If you are going to make people transfer, you have to make it less painful. Have high frequency so passengers can just show up and board. I am a bit confused about the units on a graph that shows Monthly Year on Year Change. But I think it is saying they are adding around 2.5 million new trips each year. Presumably the people per day increases by around 6800 from one year to the next . Or in other words passengers are increasing by 19 every day? yes – compares patronage in a month to the same month 12 months earlier. So the difference is the gain over the previous 12 months. Note that’s patronage, not passengers. Likely that the average passenger makes 2 trips per day, so 19 extra journeys per day leaves us with 10 extra passengers per day. Disappointing to see no speed up of western line in march. There should be something else to improve that is not related to level crossing. Such as dwell time, acceleration between level crossing and jouney after newmarket to city. Can they redesign the level crossing so it will be fool proof by design? For example they can install red light camera and issue fines for people who try to cross it in last seconds. Also the arms could be redesigned so that there is no gaps for cars to go though. Also they could install real time camera in the crossing that send video signal to the train. So that the train driver can see the real time surveillance of the ahead crossing to give them a bit more visibility and confidence. That would increase safety margins and allow a higher speed limit in level crossing. Across all mode shares (inc cars), how does the numbers for patronage compare? Bus patronage increasing by 1 per cent (YTD total) is not keeping up with population growth of about 1.3 per cent. Given that buses do the heavy lifting (and the feeding the rail network), this is a concern. Also a concern that bus numbers are not near the set targets. Overall growing at 4%, more than 3x more than population growth. The New Network should see significant patronage increase on the Southern, but the trains are already pretty full at peak because they need so many EMU sets on the Western for the 6-car services, and all EMU sets are now in service. Might have to fire up the tunnel fans at Britomart, and make use of the 104 refurbished carriages AT has sitting in storage! Forget the fans, just refurb a few of those EFs KR doesn’t want. Or get the order in now for some more units. As a regular passenger on the Southern and Eastern Lines at peak hour I very rarely see trains that don’t have at least a few seats free, I think this full train thing is a bit exaggerated, but they do need to get more units ordered as it will become a real problem at some point.